Biotin is a water-soluble vitamin with a small molecular weight of 244.3 Da and a wide distribution in animal and plant tissues. Activated biotin can covalently bind to many proteins/antibodies (also known as biotinylation) without significantly affecting their biological activities. Biotin has a highly specific interaction with avidin/streptavidin, which has been used in a variety of scientific and medical applications ranging from immunohistochemistry to drug targeting. Biologics International Corp. (BIC) provides biotinylation service to label your custom protein or antibody for application in a diverse range of elegant and valuable experiments. 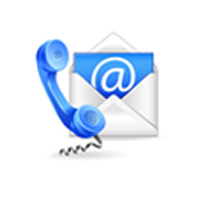 Please contact us for quotations and more detailed information. Rich experience: We have delivered >100 biotinylated proteins and antibodies. Strict quality control: We perform western blot assays using avidin to detect the biotinylated proteins or antibodies. Diverse selection: BIC can offer a wide variety of labels, including fluorescein isothiocyanate (FITC), horseradish peroxidase (HRP), and isotopes. The biotin molecule is composed of two ring structures, where one is the imidazolidone ring and the other is the thiophene ring. The terminal carboxyl group of valeric acid located at side chain of the thiophene ring is the only structure that binds to antibodies and other biological macromolecules. 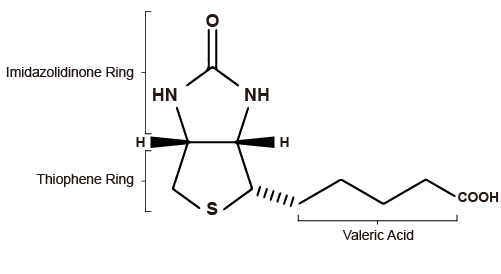 In addition, valeric acid is easily conjugated to reactive moieties and chemical structures without affecting its avidin-binding function. Due to its size and valeric acid moiety, biotin rarely disrupts the activity of proteins or antibodies, making it a good choice for labeling. Once the bond between biotin and avidin is formed, it is unaffected by extremes of pH, temperature, organic solvents, and other denaturing agents, which makes it difficult to use biotin for isolation or purification of proteins or antibodies. Conjugation of the between target protein or antibody and biotin is most commonly performed by using one of two different methods, i.e. enzymatic biotinylation and chemical biotinylation. Enzymatic biotinylation allows biotin to be linked at a single residue present in the protein/antibody, but it requires co-expression of bacterial biotin and modified antibody/protein to carry the acceptor peptide (usually a 15 amino acid peptide, termed AviTag). The advantage of enzymatic biotinylation is that the product is generated with high uniformity and can be linked to streptavidin in a defined orientation. However, chemical methods can provide greater flexibility than enzymatic approaches because the former can be performed both in vitro and in vivo. Chemical biotinylation are able to biotinylate primary amines in the side chains of lysine residues and the N-termini of proteins which results in multiple biotin attachment points and leads to high detection sensitivity. When using chemical biotinylation, a number of factors of the biotinylation reagent must be carefully considered and optimized, such as solubility, spacer arm length, and cleavability. Solubility: The solubility of the biotinylation reagent can be modified (such as by adding a polyethylene glycol spacer arm) to access hydrophobic or hydrophilic regions within the target protein or antibody and influence its solubility. Spacer arm length: It is defined as the distance between the conjugated amino acid and the biotin molecule. The availability of biotin for avidin/streptavidin binding can be increased by increasing this length. Cleavability: This refers to the ability to recover biotinylated proteins can be recovered or purified them by cleaving the biotin molecule from the target protein or antibody. At BIC, we offer both methods of biotinylation (AviTagTM technology and chemical biotinylation).